Twenty gallon fish tanks are an excellent choice for new aquarium owners. Easier to maintain than smaller tanks, 20 gallon fish tanks provide enough space to accommodate a variety of interesting fish species. Keeping water quality consistent is often easier in a 20 gallon fish tank than in a smaller sized tank. These tanks come in a range of shapes and designs, which means you can select a tank that can fit easily into the space you have available for your home aquarium. Before you select a 20 gallon fish tank for your home, think carefully about where you will locate the aquarium. This will dictate the shape of tank that suits you best. Remember, you do not have to stick with traditional rectangular fish tanks. You can also select a tall fish tank to slot into a narrow gap. Some 20 gallon tanks are curved, which means you can have even more flexibility when selecting the perfect tank for your home. Both glass and acrylic 20 gallon fish tanks are available. Acrylic is a type of plastic that is much lighter than glass and can be used to make tanks in a much greater range of shapes compared to glass. The main disadvantage of acrylic is that it scratches easily, whereas glass resists scratching. 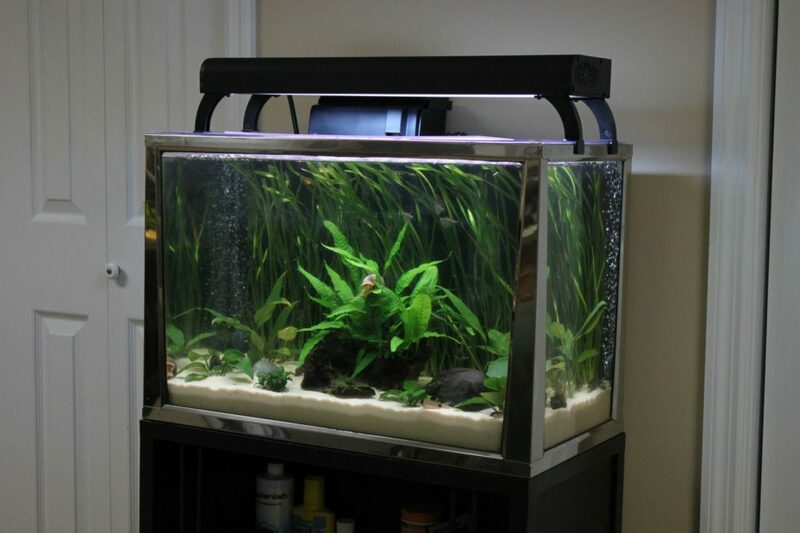 Acrylic tanks are also typically more expensive than glass tanks. Don’t forget to check out our Top Ten 20 gallon fish tanks for a more detailed look! Many 20 gallon fish tanks come in a complete kit which contains everything you will need to set up the tank and begin your life as a proud aquarium owner. If you buy a 20 gallon aquarium kit, all you need to do is follow the instructions to get your fish tank set up. If you buy a standalone 20 gallon fish tank, you will also need to buy support equipment before you can use the tank. Essential support components include a suitable filtration system, appropriate lighting, and a water heater. Tropical fish thrive in temperatures of between 24 and 27 degrees centigrade, so you will need a heater that can provide this much heat. In addition to support equipment, you will probably also want some accessories for your 20 gallon fish tank. For example, you will need gravel to line the bottom of the tank, plants to help clean the water and provide oxygen for your fish, and ornaments to create an interesting environment. Before setting up your fish tank, it is a good idea to rinse everything that you plan to place inside it, including the gravel. Use plain water with no soap or detergent—these are toxic to fish. Once all your materials are clean, put the gravel into the tank. Use a plate or saucer to weigh the gravel down, and then pour water onto the plate or saucer until the tank is about one third full. Next, hook up the airlines and other equipment, and arrange the ornaments and plants in your tank in a way that looks pleasing. Finish filling the tank but leave the lid off. You now need to leave the tank for three days before you can add fish. During this time, chlorine in the water will naturally gas off, leaving the water safe for your fish to live in. Twenty gallon fish tanks make good homes for freshwater fish such as guppies, platies, and neon tetras. You can also add some bottom feeding fish, such as cory catfish and bristlenose catfish. These fish are all quite hardy and good for beginners, including children, to look after. If you choose to stock your tank with colorful neon tetras, be sure to purchase at least five or six individuals, as these fish feel most comfortable in the company of their own species. In the wild, neon tetras live in schools of thousands of fish. Avoid selecting any fish that are too large or too aggressive for your 20 gallon fish tank. Some people try to keep tiger barbs in 20 gallon tanks, but these aggressive fish can nip the fins of other species. They are really only suitable for tanks of 30 gallons or larger. In order to keep your fish healthy, you will need to keep your tank clean and ensure that the water quality remains sufficiently high at all times. Before you add fish to the tank, it is a good idea to use testing strips to check the pH and nitrogen levels of the water. Ensure that the test results you achieve match the living conditions of your chosen fish. You will need to repeat these tests regularly. For example, you can do them during your regular water change process. Once your tank is set up and your fish are happily swimming around, you can begin your regular maintenance schedule. Roughly once every two weeks, you need to replace roughly 10-15% of the water in the tank to keep it clean. You should also vacuum the gravel during this time to remove uneaten food residue and other waste. Rinse your filter inserts and clean the aquarium walls with filter floss. Simply watching your fish feed can be a good way of checking up on the health of your tank. Look for behavioral changes, such as aggression, floating, or fish swimming on their sides. These can indicate health problems, which may result from non-optimal conditions in your tank. Also, be sure to count your fish—if any die and go unnoticed, they may quickly decompose, causing nitrite levels to spike.